Ian Douglas Ramsay, also known by his friends and colleagues as 'Muscles Ramsay' due to his research into thyroid disease and muscular dysfunction, was born in Manchester on 15 December 1935. As a consultant endocrinologist Ian made a major contribution to the study of the thyroid and metabolic muscle disease with his papers on the subject marking real advances in the understanding of metabolic muscle disease. Although born and raised in the north of England, Ian was a true Scotsman and always ensured it was well known that he was British not English. During the Second World War Ian and his older brother Peter were evacuated to a farm in Yorkshire after several houses on their street had been bombed, killing 13 people. He always remembered his childhood spent on this farm particularly fondly. His parents were both physicians and his father, William Alexander Ramsay, who was the last doctor left on the beach at Dunkirk, was a senior administrator in the National Health Service during its founding years, something Ian was always very proud of. Ian chose to follow both of his parents into medicine and received his Bachelor of Medicine and Bachelor of Surgery degrees in 1959 and an MD degree in 1964 from the University of Edinburgh in Scotland. He took an unconventional route to medicine, studying the arts at O Level and always maintained that he was able to easily understand what medical words meant because he had studied both Latin and Greek. Whilst reading medicine at Edinburgh, he sat in on most History of Art lectures. He retained this passion for art for the rest of his life and after retiring returned to further study at the Victoria and Albert Museum and the Courtauld Institute of Art. Following house officer posts at City Hospital Edinburgh and Whittington Hospital London, Ian was appointed Medical Registrar to Dr Nigel Compston, St Mary Abbots Hospital, London, in 1965, and became Lecturer in Medicine at King’s College Hospital Medical School, the University of London in 1966. As a consultant endocrinologist at the Regional Endocrine Centre, North Middlesex Hospital, his research was largely concerned with thyrotoxicosis in pregnancy and metabolic muscle disease. 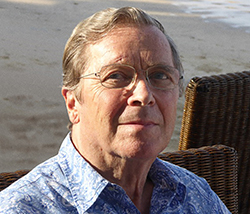 From 1979, Ian served for many years as the UK Director of Medical Education and then Associate UK Chair of Medicine for St George's University School of Medicine, Grenada, West Indies. He thoroughly enjoyed the tough job of having to visit the Caribbean annually for their board meetings. Ian had a wicked sense of humour and was most skilled in the art of the pun. He loved teaching and was also noted for being a particularly talented diagnostician. Besides medicine, he was an avid skier, loved to travel with his family and was keen on keeping up-to-date with current events, never going a day without reading the newspaper. He leaves his wife of 46 years Patricia and four daughters Fiona, Tessa, Lindsay and Anna.